Finding the perfect water bottle can be as hard as finding the perfect day bag. It seem like there are a million choices to choose from. But what are the best ones? After spending hundreds of dollars over the years and trying all kinds of bottle I think that the best water bottle are the ones made of Stainless Steel or Food Grade Aluminum as they will not only last more but the taste of your water will not be affected. The following are the best water bottle I can recommend. 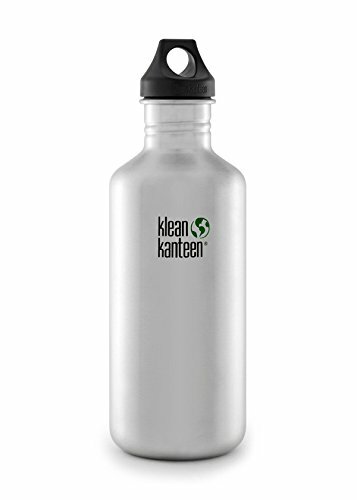 The Klean Kanteen Classic is one of the best Stainless Steel bottles on the market and is has 4.5 star rating on Amazon with almost 500 reviews. It comes in a range of sizes and colors to choose from. But in my personal opinion the original 27oz size and 16oz size are the best ones. You also have the option of getting it with different kinds of lids or buy separate kinds of lids to fit your needs. Klean Kanteen also offered an insulated version that can keep your drinks cold or hot for hours and like the classic I personally own it and is an amazing bottle. My personal collection of Klean Kanteen bottles. The Hydro Flask bottle is one of the best selling and most reviewed stainless steel water bottle available. It has almost 2,000 reviews with an average of 4.5 stars. Like the Klean Kanteen it comes in a variety of sizes and colors and since is insulated it will also keep your drinks cold or hot for about 6 hours for hot drinks and 24 hours for cold drinks. Now if you are looking for a nice looking bottle look no further. The Cayman Fitness Premium insulated bottle will not only keep your drinks hot or cold but it also looks really nice doing so. While a bit pricey I think is a good but since it looks good and has a perfect 5 star rating with over 500 reviews. - CUSTOMER SERVICE YOU CAN TRUST: We are so sure of the quality of our water bottle that we offer a no questions asked money back guarantee. If you are not satisfied for any reason, we will issue a full refund. - REMARKABLE TECHNOLOGY - Cold liquids stay cold for 24 hours without any condensation on the outside of the bottle. Hot liquids stay hot for 12 hours. You can bring soup to the ski slopes or cold water to the beach and trust that it will be the right temperature when you are ready to enjoy. - BPA AND PHTHALATE FREE: Our bottle is a safe choice for your family. The inside of our bottle is made from food grade stainless steel unlike the plastic lining of lesser quality products. Enjoy hot coffee, soup, water, or smoothies without leaching toxins into your food. - NO LEAK DESIGN - Our specially designed vacuum seal prevents leakage. Go ahead, toss your bottle in your briefcase or bag. It isn't going to leak or sweat. The wide mouth of the bottle fits standard home ice maker ice cubes and the bottle fits in cup holders. And finally here is my final recommendation from a household name. The Contigo AUTOSOUT offer up to 18 hours of insulation for your drinks and a 4.5 star rating with over 500 reviews.